This weekend should be spent mostly in rivers, and it’s helpful that the upcoming forecast is actually accommodating. A very small amount of rain forecast from the east, some wind high up, but otherwise sunshine to burn. This is my first opportunity to get out since about October last year, and I’m looking forward to it. 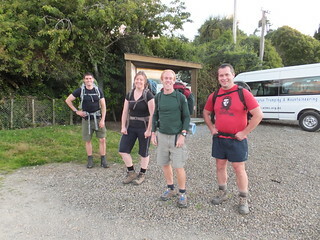 Phillip, Fiona, Andy and Alistair ready to leave. After a brief stop for dinner at Levin, we drop Harry and his guy at the bridge next to the Makaretu Stream. Starting tomorrow morning, those two intend to walk up the Makaretu before dropping into the East Waitewaewae and coming out Sunday evening at Otaki Forks. The rest of us continue to the end of Poads Road, where we meet another trampey club group (organised by Mike G) whose plan will be to walk half way up Gable End, and then follow an unofficial track direct from about .912 down to South Ohau Hut. Our own intention is to follow the Blackwater Stream up to its headwaters, hit the track at the top, then drop into Butchers Creek and the South Ohau. This evening, though, we’ll all walk in for about an hour towards a great ad-hoc campsite at Blackwater Junction. Dates: 31st January – 2nd February, 2014. Location: Tararua Forest Park, Poads Road. People: Alistair, Fiona, Phillip, Andy and me. 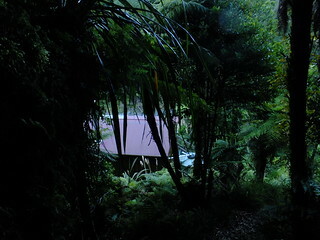 Huts visited: South Ohau Hut (1 night). Intended route: Poads Road to Blackwater Junction (Friday night), up Blackwater Stream and navigate up to point between Waiopehu (.1094) and Twin Peak (.1097). Across to Butcher Saddle, then down Butchers Creek into the South Ohau Hut for Saturday night. Out via Blackwater Junction to Poads Road on Sunday. 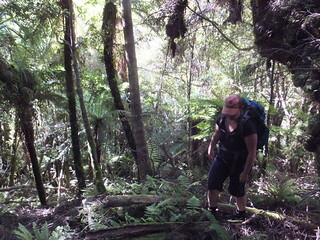 Actual route: Bailed out of Butchers Creek and straight up to near .810, then down Yeates Track. Also see: Phillip also wrote a report for the WTMC newsletter . The five of us get away before the others, walking from about 8.30pm. After a routine stroll, eventually by torch-light, we arrive at Blackwater Junction at about 9.40pm and are setting up flies in the trees just beyond the bridge over Blackwater Stream. Fiona takes the billy and a few water bottles slightly further, to fill them up from the South Ohau.s Some time before the other group wanders up and finds their own campsite. Andy’s on the other side of my tent fly. Phillip and Fiona have the another one, and Alistair’s just laying out his sleeping bag under the trees, not seeing a need for shelter this evening. Blackwater Junction is a great place for camping, and there are heaps of great clear, flat places in the trees very close to the track which passes through.Unfortunately this doesn’t translate well to the quality of my sleep tonight. That Levin takeaway dinner hasn’t gone down well, and despite the flat-ness of most of these campsites, somehow I’ve found one where my mattress is on a sideways slope. Andy, who’s sharing the fly, seems to fare much better as long as I’m not waking him. 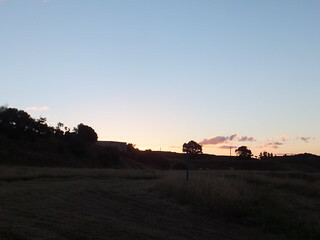 I might have risen with the bellbirds had I not already been awake. Alistair’s up not long after 6am on Saturday, strolls past the front of the fly (I say “hello” because I’ve been awake most of the night anyway), and gets started on boiling the billy. After lying for a while longer, trying to decide if it’s worth looking for any more sleep, I finally give up, unzip my sleeping bag, crawl out of the liner, rummage through my back to find breakfast, and go out to search for hot water. Andy’s doing the same. Fiona in the lower Blackwater Stream. The weather’s looking good, and at this time of year there’s daylight to burn. 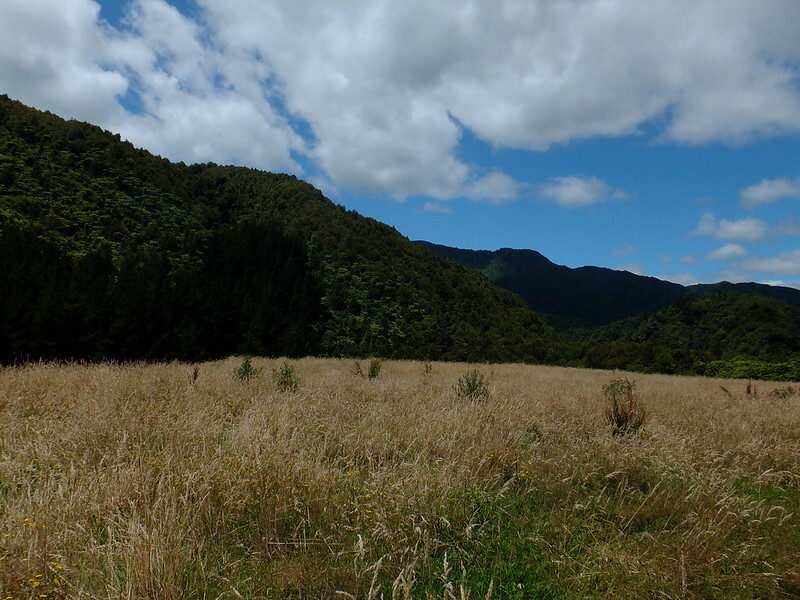 Some vague rain has been forecast from the far side of the range and a strong breeze forecast for high up, but other than that, a good and typically sunny Tararua day. The other group has apparently decided they have one too many billies, so they offload it onto us (Phillip takes it). I get mocked for being the last person ready, but I figure there’s no issue since we’d agreed on 7.30am, and there’s still ten minutes. At 7.30am we return to the bridge, cross it and easily drop down to the Blackwater Stream. Blackwater Stream is nice to walk up, as long as you know how to get out of it. 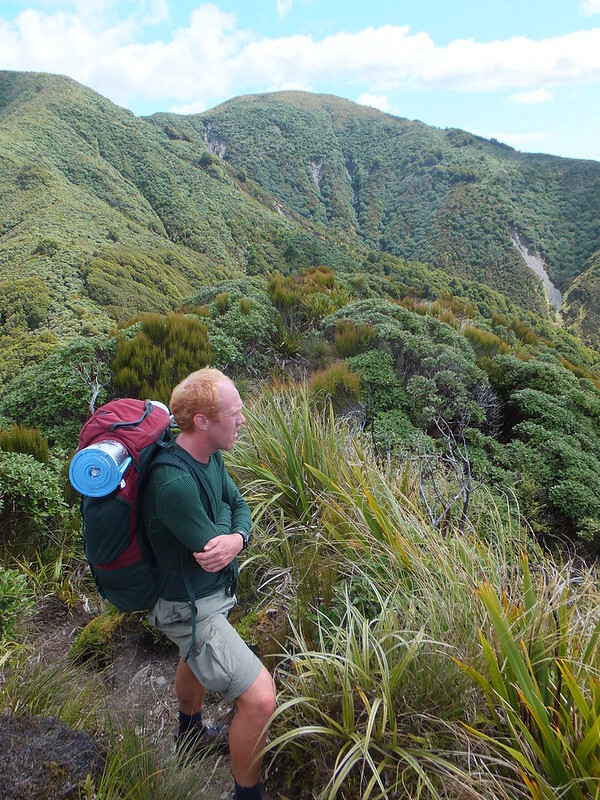 There’s an old route up one of the spurs to the site of the old Herepai Hut, but Alistair has this idea of continuing its entire length, and coming out on the track between Waiopehu (.1094) and Twin Peak (.1097). This is un-marked, but some years ago Alistair spent many daywalks up and down the river, trying alternative routes until finally figuring out the right combination of forks to reach a relatively easy route through what is otherwise Leatherwood hell. He reckons it’s a route that would be virtually impossible to stumble upon without prior knowledge. He’s offered to do tonight’s dishes if the rest of us can collectively make the right choices, and meanwhile he’ll act as some kind of omniscient oracle. For the next few paragraphs, I’ll refer to him as “the Alistair”. I don’t want to be washing custard off everything if I can help it, and I also like practising nav, so I keep my map and compass out the entire time, trying to pick all the small deviations in bearing to track where we are. It generally seems to be working but with nobody else really bothering it’s tricky to keep up at the same time. Blackwater Stream, from the junction, starts with a long, straight, wide and shallow riverbed. It’s very easy, at least as long as it’s not flooded, and although it has well defined sides in places it includes intermittent flats. I get my first finger-full of onga onga when wandering behind one set of flats. The Alistair reckons I’ve found the only onga onga plant in the entire Tararuas. We continue our travel and, after about an hour, the stream begins to climb more decisively such that we’re intermittently finding routes which sidle around some of the small rapids and waterfalls. From a particular point, the Alistair has chosen to give us up to five chances to make mistakes, after which we’ll lose the challenge. The first of these choices comes at a confluence east of .690. Left or right? This one’s fairly obvious, especially knowing where we are. Besides, looking up to the left there’s a whopping big waterfall, and I don’t fancy going that way. I think I’m the only person of the rest of us who’s actually staring at a map and compass right now (I’m the only person who brought them). We choose right (aka true left), either through careful assessment or through a lack of interest in finding a way around that waterfall. The Alistair concurs. The next choice presented by the Alistair comes at a point roughly ESE of .712. Once again I’m the only one of the four of us who’s actually fretting over the decision and (I think) with an actual idea of where we are, but with a vote we choose the left branch (true right). The Alistair agrees. It’s really not as clear a challenge as following a creek on a map, since the Alistair actually wants us to figure out what it reckons is the only way through a wide barrier of leatherwood, to come out between Waiopehu and Twin Peak. The map doesn’t indicate where this gap is, and I’m in mixed minds as to whether we should be aiming for the most obvious waterway marked on the map, or if it might be up one of the anonymous minor ribs or guts near the top. Ultimately (through intent or luck, depending on who’s voting) we elect to follow the surveyed creek to that point, which for most of the distance means choosing the branch with the most water coming from it and most consistent with the bearing needed at that position, with a couple of exceptions. 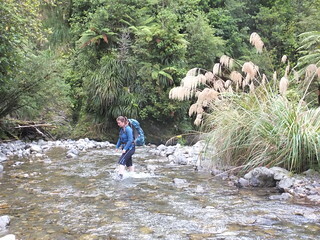 At some point, we fill up with enough water to get us along the top and (later) into Butchers Creek. It’s the last decision which is the least intuitive. Despite LINZ’s Topo50 map indicating a straight creek dropping from south to north, that route is nearly running dry, with most water coming from a feeding creek from the south-west. With some discussion, possibly egged on by the Alistair’s repetitive declarations of how impossible it is to find this way out of Blackwater Stream, but also (as I’m noting) because the dry creek follows a bearing most south (even with no idea of there actually being a route that way), we elect between us to take the dry branch. The Alistair, once again, agrees. 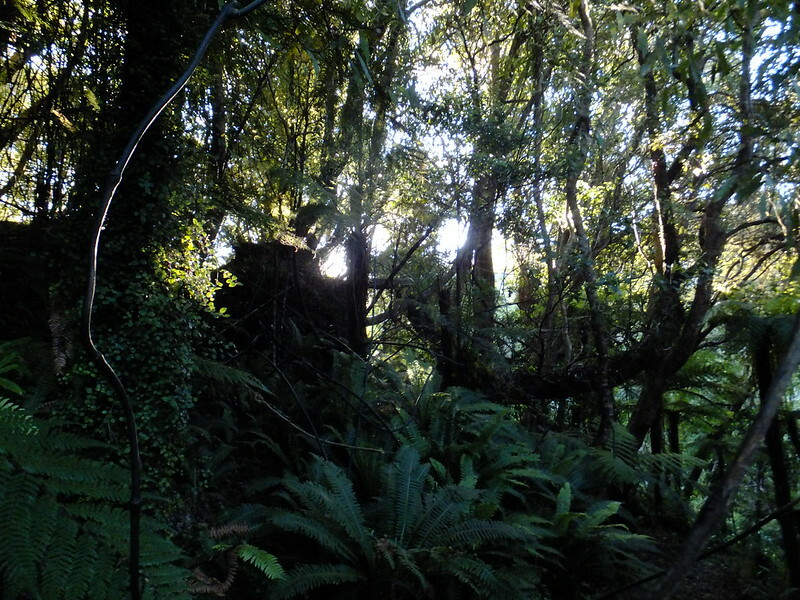 It results in a short, steep climb into lots of tangley and obscured dracophyllum, with scattered leatherwood, intermittent pack dragging, before we eventually but capably reach the formed track along the ridge between Waiopehu and Twin Peak. The entire route was completely unmarked, except for someone’s anonymous bangle obscurely hanging off a single branch. There’s not even a cairn or other obvious marker at the point where we stumbled onto the track. It’s quite nice to feel as if we’ve gotten somewhere. I never feel as if I’m climbing when in a river-bed, but somehow today we’ve already climbed from 190 metres up to about 1020 metres. It’s 2pm, which puts us maybe 90 minutes behind schedule, but there’s daylight to burn. From here we only need to get to Butchers Saddle and then it’ll be straight down the creek to South Ohau Hut. From where we stand, a bright red roof is just over there, and Alistair asks if I want to run over to bag Waiopehu Hut while everyone’s having lunch. It’s tempting. Waiopehu is one of these huts that’s not really on the way to anywhere, except maybe Oriwa Ridge. There’s not a lot of point in going there unless you specifically choose to go that way, and so I’ve not yet been there. In the end, though, I decide that it could be a long day if we mess around doing this type of thing. I’ll bag Waiopehu Hut on some other day. Instead, we make our way to Twin Peak (.1097) for a late lunch stop, although I let the others run ahead for a few minutes while I stand and watch around me. Looking towards .975 and .970 on Oriwa Ridge, from the saddle between Waiopehu and Twin Peak, where we emerged. We arrive at about 2.10pm. 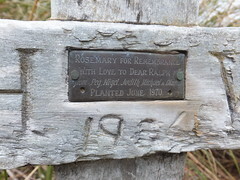 On the way, we pass not one but two memorial crosses to Ralph Wood. One is part way up Twin Peak, the other on top. 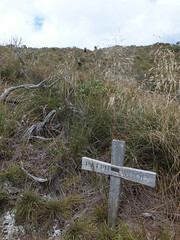 The two memorial crosses for Ralph Wood. This particular memorial is one of many which marks a much more iconic event than merely the name inscribed on the memorial: the February 1936 storm . This was a storm which wildly changed the make-up of the Ohau region of the Tararuas. 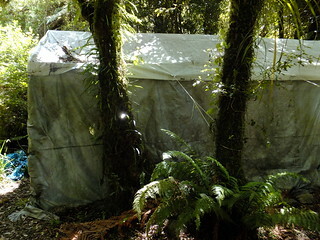 Ralph Wood was one of a party of six people trying to escape from Te Matawai Hut. Along Butcher’s Saddle they had a terrifying experience, where “trees uprooted by the storm were falling all round them and none of the party expected to survive. Progress was very slow, due to the obliterated track and exhaustion was aided presumably by intense cold and exposure.” The party made a decision to aim for Waiopehu Hut, not realising that that hut would be found to have completely disappeared in the storm. 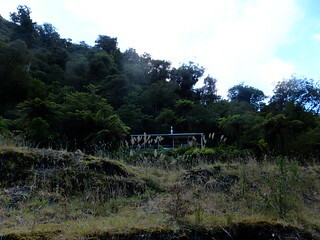 Had they instead aimed for the Ohau River hut, they would have found it crushed by trees. 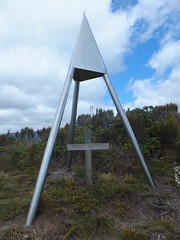 The travel would have been excruciatingly slow, and prior to their reaching the locating of Waiopehu Hut, Ralph Wood succumbed to hypothermia in the region of Twin Peak. The memorial cross marks the approximate location of where he fell. Supposedly the story behind two crosses is that, when a good samaritan decided that the original cross was in need of repair and took it away, the family believed it to have been stolen, and so replaced it with a new cross. Anyway, we’re having lunch on Twin Peak (.1097) and spot the first people we’ve seen in the range since leaving this morning. At first we believe it to be a couple of runners dropping off the top of Waiopehu 500 metres away, presumably running the loop around the Waiopehu Track and Gable End. 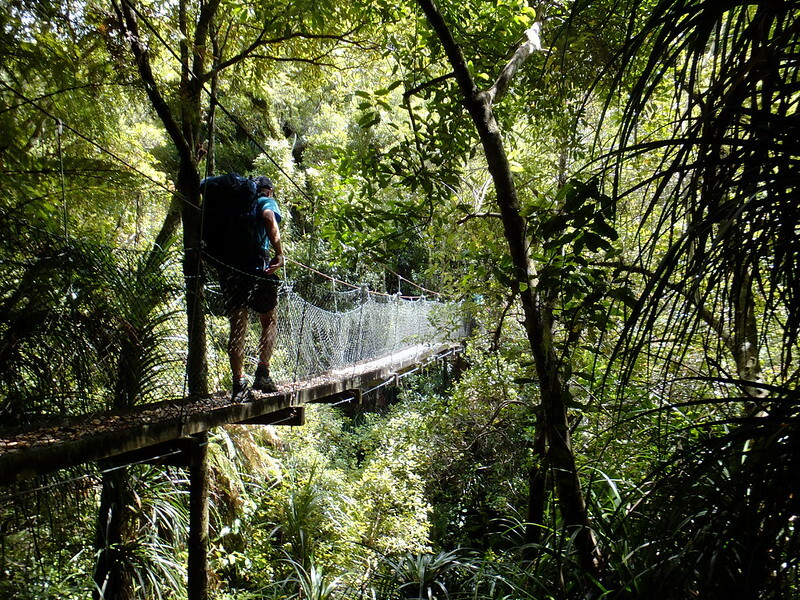 They take far too long to climb up our side and reach us, though, and when they finally do we discover it’s a couple of women busy walking the Te Araroa route, along the entire length of the country. Not something that appeals to me, but neato. It’s a little tricky to describe to them exactly where we’ve come from and exactly where we’re planning to go. 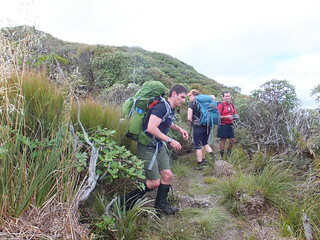 We leave at 3pm, following in their footsteps, aiming across Richards Knob (.985) at which we reach and regroup between about 3.25pm and 3.35pm, and for an eventual drop down to Butchers Saddle, where we arrive at around 4.20pm and have a sit for about 20 minutes. From here, the intent is to drop into Butchers Creek, and follow it into the South Ohau River. Andy looking down into the Blackwater Catchment, which we navigated out of, from near Richards Knob (.985). Believe it or not, I have a copy of this, printed out, within my pack. Alistair’s also read it, and obtained some extra advice. We’re going down instead of up, but we’ll be fine. 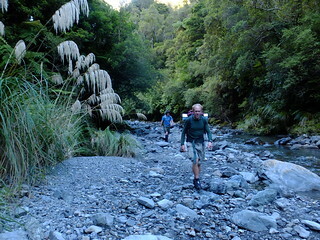 Dropping into the valley is easy enough, and we very quickly find a trickle of Butchers Creek. 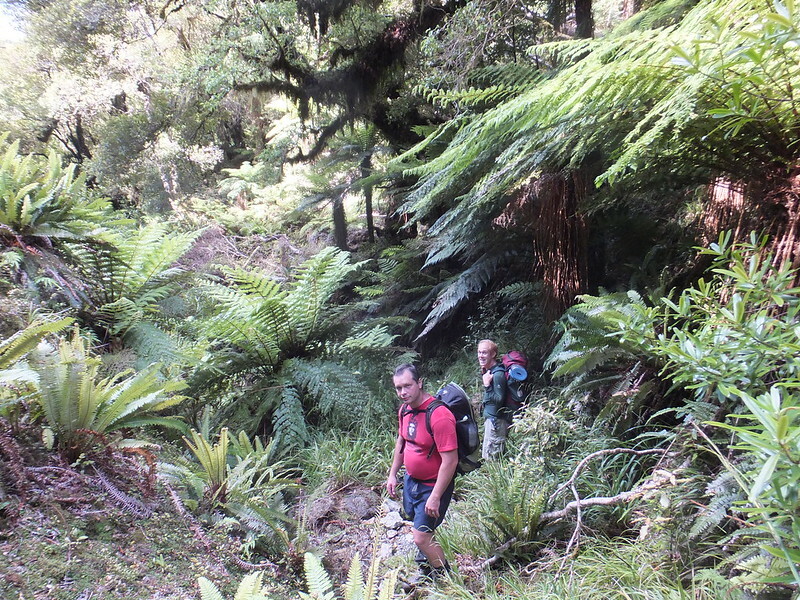 There’s one initial false attempt where we find ourselves stuck above a confluence between that creek and another… with steep sides several metres up and a carpet of crown ferns which prevent us from seeing the ground… but eventually we’re back in the creek, being careful to veer to the True Right of the creek. Alistair and Andy, dropping off Butcher Saddle into Butcher Creek. We probably should have re-read Merv Rodgers’ notes before we started, which actually say to stick to the True Left. Veering on the True Right eventually places us several decametres up a steep bluff above the creek, in what began as a simple effort to sidle around a small waterfall. Besides this, Phil in particular is starting to get exhausted (it turns out he has probably the heaviest pack of all of us.. plus that other group’s billy). Alistair noses ahead, but the whole situation is becoming risky with tiredness and iffy situations, and it doesn’t seem as if we’re getting anywhere. Returning the way we came doesn’t appeal — we’ve already dropped 130 metres vertically, in just 300 metres horizontally, and it’s taken an hour to get this far. Rather than turn around, we decide to bash straight up the side and aim for the surrounding track along the ridge, ideally Yeates Track. Phil, who’s become seriously encumbered under his pack, swaps with Andy, who barely seems to have a pack at all. It makes a big difference. Fiona, nearly back to a formed track. It’s steep at first, with much tricky clambering, but that’s typical around creeks and we anticipate it’ll become more walkable once we get high enough. This proves to be correct, and after starting again at 5.45pm, it’s from about 6pm that travel becomes relatively easy, and at 6.20 we hit an actual track again. Disappointingly it’s not Yeates Track—we’re actually not much further up from Butcher Saddle, so there’s still a task of climbing back to .810, but at least we’re on a decent track now. With time and February daylight still to burn, we sit down for another 25 minutes and enjoy the day. Everyone’s short of water, though. Nobody planned to be suddenly leaving Butchers Creek. I’m on my own emergency supply (which I keep separate from my regular bottle). It’s only 5 minutes from here to reach the junction with Yeates Track. By normal standards it’s a reasonably steep drop down to South Ohau Hut, but there’s actually a track here so it doesn’t matter. At this point in time it’s getting to have been a long day, and I just want to careen down the hill and reach the day’s end. At 7.20pm I’m some way ahead and I stop for a while, just sit and listen. After a few minutes a Kereru flaps somewhere up in the trees. Nobody comes. First sight of South Ohau Hut. Eventually, I drop my pack and hop back up the hill to see if anyone’s there. After about 4 or 5 minutes, I finally discover the other four. They’ve stopped for a cuppa — I guess someone had water after all. I say hi, but decide I’d rather just get to where I’m going, so return to collect my pack, race down what remains, walk up to South Ohau Hut at 7.53pm and wave to those inside. It’s only Mike G’s group tonight… nobody else. I re-fill my water bottle, then sit out on the deck for a while, not being bothered to take my boots off. It’s at about this point that I stare at my hands. 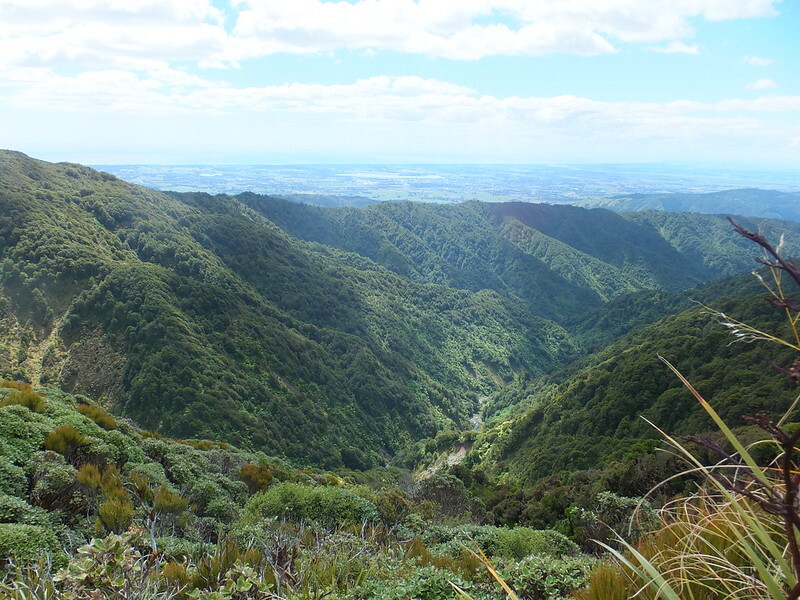 Somewhere between Blackwater Stream and Butchers Creek, I’ve had collected encounters with many of the Tararua Range’s sub-alpine plants which have common names. I’ve had handfuls of Onga Onga (aka Stinging Nettle), Bush Lawyer tangled in my skin, recurring Hook Grass (mostly an annoyance), at least one of the several breeds of cutti grass, and there was that pack-dragging incident through the dracophyllum and leatherwood. Plenty of scratches over arms and legs. Every one of my fingers has at least one cut, and presently I can’t feel three of them because something’s made them go numb. It’s great to have done that, though, and I’m sure it’ll heal quickly enough. Then I explain to Mike G why we’ve taken as long as we have. We’ve never really seemed to be in a great hurry, and much of it seems to come down to us choosing to make use of the time we had. The other group is a cheerful group. They had a very successful drop from .920 down to the hut, and have been toasting marshmallows on the campfire. They’re having a great time. So am I, for what it’s worth, but I probably for different reasons. Alistair, Fiona, Phillip, and Andy soon roll up, and people lay their claims to bunks. I arrange to drag a mattress outside so I can sleep on the balcony. Mike G has also elected to sleep out here, but everyone else seems to prefer inside. I think I’ll be happy to get to sleep tonight. All of that non-sleep last night is beginning to catch up with me. Somehow, Alistair’s thrown together the pasta meal we’ve been carrying before it’s crossed my mind to start thinking about it. It’s great. The Alistair also does the dishes. But I can’t manage dessert. Fiona also opts out, leaving Phil, Andy and Alistair to divide all that custard and cake between them. Back on the deck, I rearrange people’s boots and socks to better accommodate my mattress with a clear transit channel alongside. Mike G is asleep at the other end of the deck. I find my glasses so I can view the sky. There’s still some candle flickering from inside, but it’s not enough to blot out the sky. Clear sky tonight, but the stars’ shimmering indicates some turbulence somewhere up in the atmosphere. Four satellites slowly traverse the sky, and at least a couple of meteors in the segment I can see. It’s about 10.30pm and I fall asleep staring at Orion, who most correctly stands on his head, with a very bright planet Jupiter hanging below and to the right, somewhere in Gemini. It must be about 3.30am when I wake up again. Orion has vanished, replaced by a head-standing Leo. Another meteor streams across from that part of the sky. The transparency of the sky has disappeared, with some at-least light cloud spreading through much of the sky, causing stars to come and go. Seems I fell asleep with my glasses on. I remove them and go back to sleep. I wake again some time before 7am. Today will be an easy day, just down the Ohau River and back to Poads Road via Blackwater Junction. If anyone’s up, they’re not outside yet. I pull myself out of my sleeping bag, and go for a wander to the river. It’s a nice place. Those fingers are still numb. Outside South Ohau Hut. 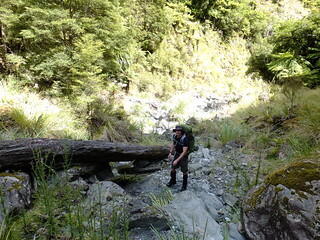 Turn right for Downling Falls, left for Deception Spur. Andy precedes Phillip in the South Ohau branch. Lazy breakfast, lazy packing, and we’re leaving the hut at about 8.45am, shortly after the other group. We catch up to them before long, and spend most of the day walking with them. This section of river is a little gorgey, at least until it joins the North Ohau river at the base of Deception Spur. With some lengthy stops, we reach Deception Spur at 10.50am, and while everyone sits for another snack and re-group, I go to find the route up the spur. I find a nice patch of bush-lawyer, but the route’s there. The semi-permanent biv site is looking very nice. Today’s turning out to be fairly routine. 20 further minutes of walking there’s a[nother] good swimming hole. I just wait for those keen on a swim as by now I’m already in the mood for getting out. As we’re preparing to leave, an older chap jogs up, from who-knows-where. He’s apparently been looking for a wet weather track, which follows high above the Ohau River on its true left, but was unable to find it. Alistair reckons it leads up from somewhere just behind Deception Spur, but he also reckons it’s a dreadful route to try and follow. We hit the exit from the Ohau River at about 12.30pm to sit for a 20 minute lunch, after a brief stop to check out the semi-permanent and unofficial biv site at about 5493185N and 1801376E. The sun’s hot, but the rest of the walk is under trees, and by 2pm we’re back at the road. I’m finally starting to feel my fingers again.